The tiny-house movement (also known as the "small-house movement") is an architectural and social movement that advocates living simply in small homes. As of 2018[update] there is no set definition as to what constitutes a tiny house. However, a residential structure under 400 square feet (37 m2) is generally considered[by whom?] a tiny home. The tiny-house movement promotes financial prudence, economically safe, shared community experiences, and a shift in consumerism-driven mindsets. In the United States of America, the average size of new single family homes grew from 1,780 square feet (165 m2) in 1978, 2,479 square feet (230.3 m2) in 2007, and 2,662 square feet (247.3 m2) in 2013. Increased material wealth and individuals with high incomes are common reasons why homes sizes increased. The small house movement is a return to houses of less than 1,000 square feet (93 m2). Frequently, the distinction is made between small (between 400 square feet (37 m2) and 1,000 square feet (93 m2)), and tiny houses (less than 400 square feet (37 m2)), with some as small as 80 square feet (7.4 m2). Sarah Susanka started the "counter movement" for smaller houses which she details in her book The Not So Big House (1997). Earlier pioneers include Lloyd Kahn, author of Shelter (1973) and Lester Walker, author of Tiny Houses (1987). Henry David Thoreau and the publication of his book Walden is also quoted as early inspiration. Tiny houses on wheels was popularized by Jay Shafer who designed and lived in a 96 sq ft house and later went on to offer the first plans for tiny houses on wheels, initially founding Tumbleweed Tiny House Company, and then Four Lights Tiny House Company (September 6, 2012). In 2002, Shafer co-founded, along with Greg Johnson, Shay Salomon and Nigel Valdez the Small House Society. Salomon and Valdez subsequently published their guide to the modern Small House Movement, Little House on a Small Planet (2006) and Johnson published his memoir, Put Your Life on a Diet (2008). Tiny House Giant Journey travels through the Petrified Forest National Park in Arizona while an RV drives by. With the depression hitting in 2008, the small house movement attracted more attention as it offered affordable, ecologically friendly housing. Overall, it represented a very small part of real estate transactions. Thus, only 1% of home buyers acquire houses of 1,000 square feet (93 m2) or less. 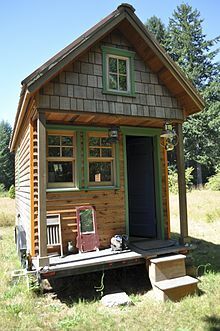 Small houses are also used as accessory dwelling units (or ADUs), to serve as additional on-property housing for aging relatives or returning children, as a home office, or as a guest house. Tiny houses typically cost about $20,000 to $50,000 as of 2012. Tiny houses have received tremendous media coverage  including a serial television show, Tiny House Nation, in 2014 and Tiny House Hunters. The possibility of building one's own home has fueled the movement, particularly for tiny houses on wheels. Tiny houses on wheels are often compared to RVs. However, tiny houses are built to last as long as traditional homes, use traditional building techniques and materials, and are aesthetically similar to larger homes. In Japan, where space is at a premium, Takaharu Tezuka built the House to Catch the Sky in Tokyo, a 925-square-foot (85.9 m2) home for four. In Barcelona, Spain, Eva Prats and Ricardo Flores (Flores & Prats) presented the 300-square-foot (28 m2) House in a Suitcase. The NestHouse™ tiny house designed and built by Jonathan Avery of Tiny House Scotland, Linlithgow UK. ; a 23 m² (250 sq ft) modular move-able small eco-house to explore the possibilities of sustainable small-scale living  in a highly insulated timber framed structure with some Passivhaus principles ensuring very low energy usage. The estimated cost for the Nesthouse is 55,000 euros. In Germany, the community of Vauban created 5000 households in an old military base in Freiburg. The planned density of the building on that area is of 50 dwelling units per acre. In Germany, British architect Richard Horden and the Technical University of Munich developed the Micro Compact Home (M-CH), a high end small (76-square-foot (7.1 m2)) cube, designed for 1–2 persons, with functional spaces for cooking, hygiene, dining/working, and sleeping. In New Zealand, more companies are building tiny houses, mostly bespoke and customized. Bryce Langston, a film-maker with a passion for small space design, permaculture, and downsized, eco-friendly living has created short, documentary-style videos on small space living for YouTube via his channel and website 'Living Big in a Tiny House'. In Australia some interest commenced through designers such as Fred Schultz. T.I.T.A.N. Hills along Victoria's scenic Great Ocean Road, is the world's first master-planned, ecological, off-grid, tiny home subdivision. The popularity of tiny houses has led to an increase in amateur builders which has raised concerns regarding safety among tiny house professionals. In 2013, the Tiny House Fair at Yestermorrow in Vermont was organized by Elaine Walker. An attendee at the event, Jay Shafer, suggested promoting ethical business practices and offering guidelines for construction of tiny houses on wheels. Walker continued this effort in 2015, creating the non-profit organization, American Tiny House Association. Walker and founders Elizabeth Roberts, Andrew Heben, Robert Reed, and William Rockhill promote tiny houses as viable living spaces and work with local government agencies on approving zoning and coding regulations that are favorable to tiny houses. One of the biggest obstacles of the tiny house movement is the difficulty in finding a place to live in one. Zoning regulations typically specify minimum square footage for new construction on a foundation, and for tiny houses on wheels, parking on one's own land may be prohibited by local regulations against "camping." In addition, RV parks do not always welcome tiny houses. Lower court decisions in the US have struck down zoning laws related to size that were an obstacle to tiny housing. One of those cases was League of South Jersey, Inc v. Township of Berlin, where the court found that a zoning law related to the size of a home did not protect citizens, so the law was struck down. These decisions are still far from being the majority, but they help in allowing the propagation of the tiny housing movement. In 2014, the first "tiny house friendly town" was declared in Spur, Texas; however, it was later clarified that a tiny house may not be on wheels but must be secured to a foundation. In July 2016, Washington County, Utah revised their zoning regulations to accommodate some types of tiny houses. Increasingly, tiny houses have become larger, heavier, and more expensive. The ideal of minimal impact on the environment is being lost as businesses capitalize on the popularity of tiny homes. The distinction between tiny houses and luxury RVs is diminishing, causing some of the long time leaders to abandon the movement. The financial crisis of 2007–08 fueled the growth of the small house movement. In several cities, an entrenched homeless population formed around "tent cities" or encampments that became semi-permanent housing. Homelessness in these communities was driven by foreclosures and expensive mortgages from the United States housing bubble. Tiny houses became an affordable option for individuals that lost their homes. With their low cost and relative ease of construction, tiny houses are being adopted as shelters for the homeless in Eugene, OR; Olympia, WA; Ithaca, NY; and other cities. Communities of tiny houses offer residents a transition towards self-sufficiency. Communities such as Othello Village in Seattle, WA, originally lacked electricity and heat. In Seattle, non-profits have stepped in to help provide amenities. The tiny house option can often be low-cost and is sometimes used to provide housing for the homeless; however, the long-term viability of tiny houses for the homeless is completely dependent on the structure and sustainability of the model. Housing the homeless is said to be a cost-saving for municipalities, but the strict zoning and land ownership laws make it difficult for this movement to take root. Some of the benefits of access to housing include privacy, storage, safety, restoration of dignity, and stability. In Reno, Nevada, faith-based groups and community advocates have legislated for new zoning for housing for homeless persons via a tiny home community. Each tiny house would cost an estimated $3,800 to build, as well as an operating budget of $270,000 for case managers to help residents find more permanent housing and a project manager position. One challenge besides zoning and funding has been a NIMBY response by communities. Communities may weigh concerns over tiny home communities becoming shantytowns or blighted neighborhoods that reduce property values of the surrounding neighborhoods. For cities such as Chicago, tiny houses are seen as an appealing option to close the gap in housing availability. Community planners also have concerns that communities don't devolve into shantytowns such as during the Great Depression in "Hoovervilles". In California, the City of Richmond has engaged UC Berkeley students involved with the THIMBY (Tiny House In My Backyard) project with a pilot program for developing a model for six transitional tiny homes to be placed in Richmond. This is in-line with developing efforts in the SF Bay Area to use micro-apartments and tiny houses in combating the housing crisis and Homelessness in the San Francisco Bay Area. Similar efforts of using tiny houses to house the homeless are also ongoing in Oakland through a partnership between the City of Oakland and Laney College. In Edinburgh UK the Social Enterprise Social Bite asked Jonathan Avery of Tiny House Scotland to design a variation of his NestHouse tiny house to create a two bedroom version for its Homeless Tiny House Village in the Granton area of Edinburgh. The village was opened on May 17, 2018 by the Scottish Cabinet Secretary for Communities, Social Security and Equalities, Angela Constance MSP and features eleven NestHouse Duo tiny houses and a community hub building all built by Carbon Dynamic. In the co-authored research article The Psychology of Home Environments, it's argued that the drive behind the tiny house movement is centered around desires of modesty and conservation, in addition to environmental consciousness, self-sufficiency, and wanting a life of adventure. Environmental psychologists reason that homes influence people's emotional state because they “facilitate the social interactions and the power dynamics that are played out in a home”. In building tiny houses, there is often a misalignment between the needs of the occupant(s), and the expressed design from the creating team. This reality is used as a call for architects and design teams to work with psychologists to build tiny homes that are better suited towards the needs of the occupant(s). In understanding these considerations, it is important to note that not everyone is suited for a tiny house. Smaller homes are less expensive than larger ones in terms of taxes and building, heating, maintenance, and repair costs. The lower cost of living may be advantageous to those 55 and older with little savings. In addition to costing less, small houses may encourage a less cluttered, simpler lifestyle, and reduce ecological impacts for their residents. The typical size of a small home seldom exceeds 500 square feet (46 m2). The typical tiny house on wheels is usually less than 8 by 20 ft (2.4 by 6.1 m), with livable space totaling 120 sq ft (11 m2) or less, for ease of towing and to exempt it from the need for a building permit. Small houses may emphasize design oversize, utilize dual purpose features and multi-functional furniture, and incorporate technological advances of space saving equipment and appliances. Vertical space optimization is also a common feature of small houses and apartments. As small houses may be attractive as second homes or retirement houses, their increased utilization may lead to development of more land. People interested in building a small home can encounter institutional “discrimination” when building codes require minimum size well above the size of a small home. Also, neighbors may be hostile because they fear negative impacts on their property values. There has also been opposition based on this fact, due to concerns about increased taxes. Tiny homes range typically between one hundred and four hundred square feet with the size fluctuating depending on the owner. Considering the small size of tiny homes in comparison to that of average sized homes, energy costs are invariably smaller; moreover, tiny home power grids are typically sourced from solar panels which decreases the amount of energy necessary for sustainability. More importantly, the price difference of using solar power on a tiny home in comparison to an average sized home significantly decreases homeowner expenses.Thus, the difference in energy emissions and cost necessary for output between a tiny home and average sized home varies notably. While a tiny home is sustained to operate on 914 kilowatts a year, producing on average 1,144 pounds of carbon dioxide, an average size required 12,733 kilowatts which releases close to 16,000 pounds. Consequently, tiny homes intrinsically need to consume less energy to support the homeowner while simultaneously requiring fewer materialistic items. The limited space of a tiny home requires that owners sacrifice the idea of abundant materialism; it allows for the revaluation of personal habits and therefore translates into awareness surrounding environmental sourcing. The concept of a “tiny” home translates to all aspects; a minimized space is capable of encompassing the bare minimum, from less surface area, fewer physical items and less energy consumption. Human beings have been the main contributor in recent environmental changes. One critical proponent of these changes relates to infrastructure; buildings affect both human beings and the environment, however the costs tend to lie within the environment while the benefits are exclusive to humans. Also, the intention of building new infrastructure is for it to be sustainable for a long period of time. As a result, the less environmentally intentional a facility, the more it will depend on consumption of natural resources. “Part of the very definition of a tiny home is that it be constructed with environmentally conscious and renewable materials.” Most tiny homes are designed to receive their services in ways that are less environmentally exhaustible. Electrical grids and public utilities are a distinguishable way tiny homes could receive various services, from water and sewage. This detail is critical for consideration when individuals move from average sized homes to tiny homes because it allows individuals to both, save money while using less environmental resources. Another important environmentally conscious feature relates to toilets. Some tiny homes are equipped with incinerator toilets which get rid of waste by burning it rather than flushing. By eliminating toilet flushing, the amount of water used in a household significantly decreases. An alternative feature is a compost toilet which works by decomposing the waste which also relies on evaporation to remove the waste. Therefore, not only are tiny homes energy efficient, the makeup of these homes are also intended to be environmentally friendly. In order for new materials to be both utilized in construction and sustainable for long periods of time, the production of such materials requires various chemicals; this added step takes an extra resources from the environment. An alternative to this is the usage of recycled materials which reduces the need for added chemicals because the process has already occurred. For example, the tiny homes designed by a group in Texas, consciously avoid using new materials in their construction. Bearing in mind the fact that human beings expend between 30-40% of all energy, infrastructure is best fit to include the consumption of human beings within its blueprints. Those individuals who live in tiny homes are directly connected to the environment primarily because of the vicinity between tiny homes and nature. Through such constant contact, the homeowner is given the opportunity to better understand the functions of nature, and this understanding allows for an increase in environmental awareness. More so, the design of tiny homes are subject to individual modification; the style, level of sustainability, intricacy, materials used, and modifications are all determined by homeowner preferences. Homelessness is a critical issue in the United States. According to The U.S. Department of Housing and Urban Development, about five-hundred and fifty thousand individuals were homeless on one given night in 2018. Over half of those individuals were able to sleep in different types of shelters while roughly thirty-five percent were unable to reside in a sheltered area. Despite the little information provided on such an issue in popular media, homelessness has the capacity to affect the environment dramatically. According to Environmental Council of Sacramento, homelessness is a contributor to environmental deterioration. For example, waste [litter, drug paraphernalia, etc.] produced by the homeless accumulates around their living spaces which tend to be near waterways, sewage systems, or parks. This leads to the contamination of the surrounding ecosystem. The Environmental Council offers steps towards conserving the environment while simultaneously dealing with the issue of homelessness. These steps include the cleaning of various water systems and public spaces in order to provide both clean water and clean areas for all individuals of the community. One of the steps also includes governmental intervention in establishing sanitary and safe spaces for the homeless in order to prevent further environmental destruction. Luckily, systems for just that are beginning to form though the tiny house movement. A critical form of combating chronic homelessness is the establishment of tiny house communities. Those behind such establishments aim to help individuals solve their housing problems and offer a space where individuals can connect with other's who find themselves in similar circumstances. Creating these communities requires a variety of support, however the end goal is ultimately shared. The primary actors behind the building and funding of tiny homes for the homeless are non-profit organizations. Their goal is not only to give homeless people a place to live, but also offer them resources to help them in all aspects of their lives. Building communities of tiny homes for the homeless is a group effort involving the homeless, cities themselves, and housing patrons. Though their efforts, the issue of homelessness in itself along with its effects on the environment are being simultaneously dealt with. ^ Mitchell, Ryan (August 8, 2009). "What is the tiny house movement". The Tiny Life. The Tiny Life. Retrieved May 12, 2010. ^ "About Tiny Houses". Tiny House Town. Archived from the original on 6 March 2016. Retrieved 29 February 2016. ^ Compare: Kilman, Charlie (17 January 2016). "Small House, Big Impact: The Effect of Tiny Houses on Community and Environment" (PDF). Undergraduate Journal of Humanistic Studies (Carleton College). Retrieved 10 November 2018. By placing greater emphasis on quality living, personalization, an environmental ethic, and community values, the tiny house subverts the consumer-based mindset. Culturally, what the tiny house does is simple: it creates an opportunity outside the norms of society where people can understand that the value of the environment and human interaction is much greater than the value of material goods. ^ a b c d e Carmela Ferraro (February 21, 2009). "Small but perfectly formed". Financial Times. ^ "Tiny House FAQs". Tiny House Community. Retrieved 21 June 2017. ^ "Four Lights Tiny House Company". www.facebook.com. Retrieved 21 June 2017. ^ "About". 26 February 2011. Retrieved 21 June 2017. ^ The Economist (February 19, 2009). "Very little house on the prairie". The Economist. Retrieved March 7, 2009. ^ a b c Brenoff, Ann (Oct 22, 2012). "Downsizing: Could You Live In A Tiny Home In Retirement?". The Huffington Post. Retrieved Oct 24, 2012. ^ Fox News (February 11, 2014). "High Tech Meets Low Tech in Tiny House Movement". Fox News. Retrieved March 1, 2014. ^ Heather Dirubba (February 26, 2014). "Tiny A&E Network Unveils FYIs First Programming Slate and July 7 Launch Date". A&E Network. Retrieved March 1, 2014. ^ Mitchell, Ryan (November 2, 2014). "The Tiny Life". The Tiny Life. The Tiny Life. Retrieved November 14, 2014. ^ Palongue, Pamela (2016-06-03). "The House that Jonathan built". Tiny House Living. Retrieved 7 June 2016. ^ Mackenzie, Steven. "Tiny Solution to a Big Housing Crisis". bigissue.com. Big Issue. Retrieved 2 August 2016. ^ Steffen, Alex (2008). Worldchanging: a User's Guide for the 21st Century. New York: Abrams. pp. ppl: 152–154. ISBN 978-0810930957. ^ Robertson, Margaret (2014). Sustainability: Principles and Practice. Routledge. pp. ppl: 208–222. ISBN 9780203768747. ^ Lloyd Alter (July 10, 2008). "Home Delivery: The Micro Compact Home Comes To America". Treehugger. Retrieved March 7, 2009. ^ Evans, Kate (July–August 2018). "Tiny houses". New Zealand Geographic (152): 32–55. ^ "Living Big in a Tiny House". Living Big In A Tiny House. Retrieved 2019-01-05. ^ Speed, Alex (16 January 2016). "Big dreams for tiny house movement". The Australian. ^ Walker, Elaine (2013-06-18). "Tiny House Alliance". Tiny House Community. ^ Walker, Elaine (2015-01-27). "Where to Live in a Tiny House". Tiny House Community. ^ a b Mitchell, Ryan (2014-07-18). "Tiny House Building Codes". The Tiny Life. The Tiny Life. Retrieved 2014-08-20. ^ "N.C. RV Park Offers Take On Tiny House Friction". RV Business. RV Business. 2015-08-06. Retrieved 2014-08-08. ^ "Home Builders League of So. Jersey, Inc. v. Twp. of Berlin". Justia Law. Retrieved 2018-03-05. ^ Vail, Kathrine M (2016). Saving the American Dream: The Legalization of the Tiny House Movement. Louisville, Ky. : Louis D. Brandeis School of Law at the University of Louisville. pp. ppl: 357–379. ISSN 1942-9274. ^ Spur, TX (July 9, 2014). "Spur Freedom". ^ Garfield, Leanna (July 6, 2016). "Most Expensive Tiny Homes in the US". Business Insider. ^ "The world's largest architecture firm is creating a $2 million tiny home village for California's homeless". Business Insider. Retrieved 2018-02-08. ^ Burkeman, Oliver (2009-03-26). "US tent cities highlight new realities as recession wears on". the Guardian. Retrieved 2018-02-08. ^ a b Lewis, Paul (2017-03-23). "Tiny houses: salvation for the homeless or a dead end?". The Guardian. ISSN 0261-3077. Retrieved 2018-02-08. ^ Heben, Andrew (2014-07-11). Tent City Urbanism. The Village Collaborative. ISBN 978-0692248058. ^ "Tiny Houses for the Homeless". PBS. 2014-10-10. ^ "Tiny homes with a view: Ithaca volunteers provide shelters for homeless men (video)". syracuse.com. 2014-12-15. Retrieved 2015-11-05. ^ Mingoya, Catherine. "Building Together. Tiny House Villages for the Homeless: A Comparative Case Study" (PDF). Department of Urban Studies and Planning (MIT). Retrieved 22 February 2018. ^ "Tiny houses aren't just for Millennials. They could help homeless". USA TODAY. Retrieved 2018-02-08. ^ Isaacs, Deanna. "Are tiny houses a solution to homelessness in Chicago?". Chicago Reader. Retrieved 2018-02-08. ^ "Can tiny houses solve the homeless problem?". Retrieved 2018-02-08. ^ Hall, Sam Omar (2016-04-13). "With laws changing, tiny homes may have a big effect on housing". Richmond Confidential. Richmond Confidential. Retrieved 11 May 2018. ^ "Tiny homes proposed for homeless in Richmond pilot project". KTVU. KTVU. July 18, 2017. Retrieved 10 May 2018. ^ "Richmond Experiments With Tiny Houses for Homeless | Richmond Pulse". richmondpulse.org. Richmond Pulse. July 27, 2017. Retrieved 10 May 2018. ^ Martichoux, Alix (January 23, 2018). "Is tiny living working? Bay Area residents share challenges of micro homes and bus life". SFGATE. Retrieved 10 May 2018. ^ Firth, Andrea A. "Laney Builds Tiny Houses". www.oaklandmagazine.com. Oakland Magazine. Retrieved 11 May 2018. ^ "Social Bite's village for homeless people has launched". 2018-05-17. ^ "The psychology behind the tiny house movement | Research UC Berkeley". vcresearch.berkeley.edu. ^ Adams, C., & Williams, A. (2016, May). Square footage. Business North Carolina, 36(5), 56. ^ Rami Lulu (March 18, 2016). "5 Advantages of Living in a Mini Home". AskAvenue. Retrieved March 21, 2016. ^ a b Bethany Lyttle (February 16, 2007). "Think Small". New York Times. ^ Al Heavens (June 14, 2007). "Smaller Could Be the Answer to a Lot of Issues". Realty Times. Archived from the original on March 22, 2009. Retrieved March 7, 2009. ^ Carol Lloyd (April 27, 2007). "Small houses challenge our notions of need as well as minimum-size standards". SFGate. Retrieved November 7, 2013. ^ Josh Dehass (November 13, 2008). "Laneway housing pilot proceeds despite opposition". UBC Journalism News Service. Retrieved July 27, 2012. ^ Charlie Smith (April 10, 2008). "Anxiety grows over EcoDensity in Vancouver". straight.com. Retrieved July 27, 2012. ^ Ned Jacobs (June 8, 2010). "The Vancouver neighbourhoods backlash continues". www.francesbula.com. Retrieved July 27, 2012. ^ a b c d e f g h i j Kaufmann, Carol. "The Tiny House Movement and Livable Communities". AARP. Retrieved 2019-03-28. ^ "Tiny House, Big Impact: Getting Green by Building Less". Planet Forward. Retrieved 2019-03-28. ^ a b c d Kilman, Charlie (Winter 2016). "Small House, Big Impact: The Effect of Tiny Houses on Community and Environment" (PDF). Undergraduate Journal of Humanistic Studies. 2: 12 – via Carleton College. ^ a b c d e f Mutter, Amelia (2013). Growing Tiny Houses Motivations and Opportunities for Expansion Thorough Niche Markets. Lund, Sweden: European Commission's Erasmus Mundus Programme. ISBN 1401-9191 Check |isbn= value: length (help). ^ a b c d Alexandra Reagan (2018-01-25). "Homelessness is an Environmental Issue". ECOS. Retrieved 2019-03-28. Furst, A. (2017). Finding Space. Understanding how planning responds to tiny houses for homeless populations (Masters). McGill University School of Urban Planning. Turner, C. (2017). IT TAKES A VILLAGE: DESIGNATING "TINY HOUSE" VILLAGES AS TRANSITIONAL HOUSING CAMPGROUNDS. University Of Michigan Journal Of Law Reform, 50(4), 931-954. Vail, K. (2016). Saving the American dream: The legalization of the tiny house movement. University of Louisville Law Review, 54(2), 357-379. This page was last edited on 19 April 2019, at 23:27 (UTC).